Feel like taking an exciting journey without even needing to leave the comfort of your own home. Click here to play! This slot will provide you with an exciting adventure, as well as plenty of rewards if you succeed in your missions. 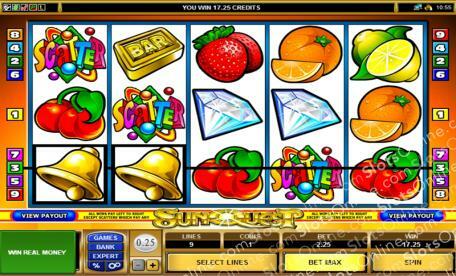 SunQuest is a fun 5-reel slot played across 9 pay lines. Your best chance for success is to spin up the SunQuest logo, which will payout whenever two or more appear on active pay lines, up to an incredible 10,000:1 payout. The Wild symbol can be substituted for any other symbol on the reels except Scatters in winning combinations. If three or more Scatters appear anywhere on the reels you will win yourself some cash, and if you manage all five in one go you could win up to 50 times your bet! SunQuest is looking for its next adventurer; there is plenty of money to be won at this slot machine, so start playing for your chance to win today! The Scattered symbol will payout when three or more appear on the reels, up to 50 times your wager if you manage all five. The Wild logo does not payout on its own, but it can be substituted, except for Scatters, into winning combinations.